Ooooh this is an exciting post. I’ve known Pete for a while – he’s one of those people I have no memory of first meeting, but who has always been someone whose work and life and thoughts I respect. He’s been on a very exciting journey recently, and he agreed to share a little about that here. If you’re looking for a book to bring with you on holiday this summer, look no further! Pete, thanks so much for following your dreams and letting us enjoy the fruit of that process. Can you tell us a little bit about yourself? I’m Peter J. S. Waugh, 30 years old from Belfast. I live in Newtownabbey with Kerry and our cat Rusty. Kerry runs The White Letter, a stationery company. We have been married for 4 1/2 years. My two front teeth are false and I am a massive fan of Arsenal F.C and can count to 100 in Latvian. Nice! Tell me – have you always loved writing? I have always been interested in expressing how I feel – through conversation, actions or reflecting through writing. I was pretty frustrated at school because I liked to explore the narrative and background to things instead of just giving the necessary answers. This led to countless journals of horribly written songs and hours of pouring how I felt about life and the world around me. Through my twenties my love for narrative, telling stories and using words to inspire others continued to grow. It wasn’t until a few different, random, unconnected people kept speaking into my life about how I had a gift with words that I began to take it seriously – that was in my mid-late twenties. What about the book…how did it come about? I have always been fascinated by America. I find the culture, subcultures, the quirks, the landscapes and the people so interesting, but I had to wait until I was in my twenties to make my first trip. I was fortunate enough to go back again on honeymoon. During the first part of our trip we stayed in NYC. Kerry wasn’t feeling great to had to rest for a few days. I spent some of that time walking around Manhattan by myself, taking in the wonderful city. It was my second time in New York and I was again captivated by the magic of the city. 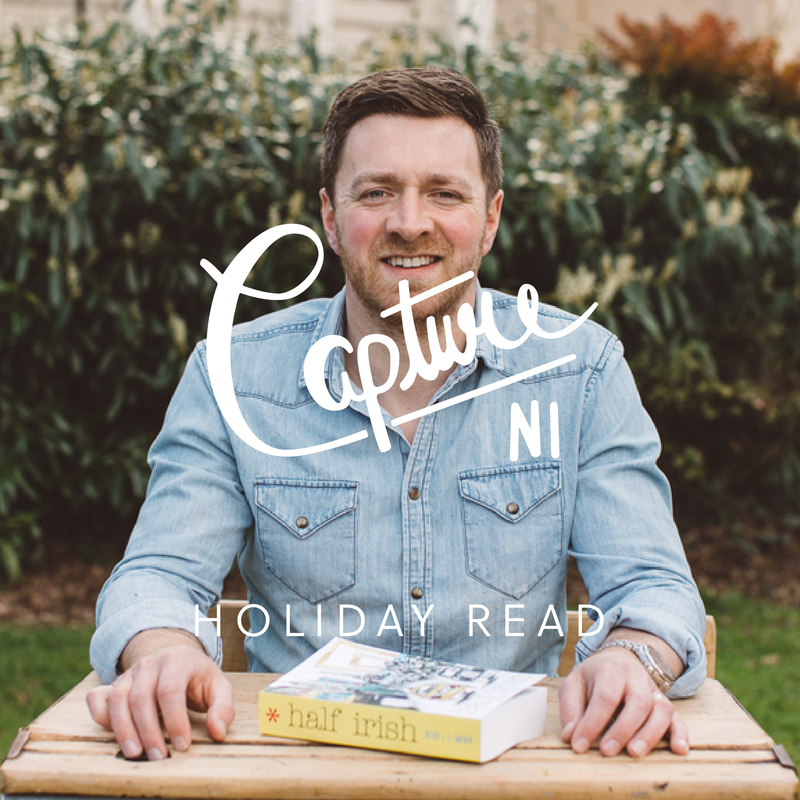 Inspired, I spent time in coffee shops and bars scribbling down thoughts about a book – which became Half Irish. So when and how did you start writing Half Irish? I started 4 years ago! When I came back from honeymoon we were busy setting up home, I was working full time and doing a Masters. Kerry then set up a business so I put my book on the back burner for a while. I went back to the book every week for a few hours, but it wasn’t until 2 years ago, when I took a new part time job, that I was able to dedicate what I call ‘good time’ to writing the book. It was a natural decision to go part-time and focus on the book. When you are carrying something that is so important you will do anything to see it come to life. Sacrifices become opportunities. I managed to finish the book and then spent August 14 – March 15 going through the editing process with my editor. Regarding my way of writing I try and write in the mornings – before email, internet and other distractions. If I miss my morning writing time I will spend time in the evening writing. I write 5 out of 7 days and on the 6th day I won’t write but will reflect on the week. I now have a writing schedule that takes me through to the end of 2016! I alternate between computer and my notepads. Such discipline. Love it! What’s Half Irish about, then? It’s a coming of age love story! Tyler is an 18 year old guy who lives in the Village area of NYC. His mum emigrated to NYC from Belfast in the 80’s and Tyler comes over to Ireland to spend the summer with his cousin. The first quarter of the book is about Tyler getting his first job and discovering his gifts and talents and the rest of the book is a laugh out loud, page turning love story! I wanted to write a book about Belfast that wasn’t based on the Troubles. The tone of the book is positive, hopeful – it’s kinda like a travelogue around Ireland, through the eyes of an inquisitive, loveable, music loving, guitar playing American. I have had some fantastic press about the book – from The Belfast Telegraph, Jack Wills, Ulster Tatler and I was involved in a Salon at the Belfast Book Festival. Amongst other positive things The Ulster Tatler called my book ‘A wonderful debut’ and Jack Wills recommended the book as a must read for Summer 2015. So good! Congratulations. If it’s not too unfair a question, can you tell us what your favourite part of the book is?! Yeah that’s an unfair question!! There are so many bits that I enjoy! The chapters entitled The Bike Factory, How Now Brown Cow, Afternoon Tea, Dongle and Botanic are some of my favourites – but you’ll have to read them to find out what they are about! OK – I’ll give you some insight! In the chapter entitled Dongle I wrote a letter to Tyler from his Grandpa. I never met my Grandfathers so the letter contains the words I would have loved them to say to me. Totes Emosh!! Wow. That’s lovely. Now, we know you write, but you also do other things. How do you balance your schedule? Yeah. I’m a part time youth worker, work for Kerry’s business and let’s not forget I’m a writer! Over the last 18 months I was also a voluntary project director/co-editor on a national youth work book and was on a pretty intense, yet amazing leadership development programme. It’s only now that I’m realising how crazy things have been which means I’m saying no to a lot of things, as I have said a massive yes to my writing and a few other exciting avenues. Over the last year I have learned that we can’t balance things and I have been encouraged to think of life as a blend. We can waste a lot of time trying to get things ‘balanced’ but life changes so much that it’s best to see it as a series of seasons. I’m the type of person that when I say yes to something I throw everything I have behind it. Increasingly that means saying yes to less so I can be fully committed to those things I have taken on. That’s the long term view. The way I find peace and cope with things in the short term is through daily times of silence and reflection. This is a non-negotiable in my life. My wife – through her creativity, perseverance and work ethic. My dad is also a huge inspiration. He has been working in education for 44 years. That’s a huge achievement and a few years back he received an MBE for his efforts. He gets up everyday and serves others with passion and great integrity. Wider than that I love finding out about people and hope to carry away a learning point from every conversation – even if it’s just a fleeting thought. There’s a young adult I have worked with for a few years now and he has been inspiring me loads lately through his demonstrations of generosity. Regarding ‘inspirational celebrities’ I don’t really know/have any – it’s hard to know someone through their twitter feed/news coverage. As a writer I love reading autobiographies and the writings of Nick Hornby, C.S. Lewis and I love a good Rom-Com! Don’t write to be famous (or rich! ), write because if you didn’t a part of you would die – and that would be a horrible thing! As you write you will find the fulness of life. Oh and challenge yourself with new types of writing, new genres, lengths of pieces. Even if that makes you uncomfortable I promise you will learn something from it. When you get an idea – run to the hills with it and don’t come out until it’s finished!! Great advice! Now tell us…what’s next for you?! As mentioned earlier I have a writing schedule for the next year and a half – which may sound pretty restrictive but actually it’s really liberating to know that I have things to be getting on with and exciting projects to write. I also have this list of projects that I would love to write. It’s like an Amazon wish list, but instead of things I want to buy it’s projects I want to write. Last time I looked at the list I stopped counting at 18 projects – the list ranges from kids books, articles to a full blown YA fantasy series!! Pete, thanks so much for such a fascinating interview. I can’t wait to read Half Irish (I’ll post a review here!) and see where you go to next. The book is available on www.petewaugh.com, iBooks, and Amazon Kindle. Get it onto your Holiday Reading lists and let us know what you think! Finally, enjoy this short video from Pete and the legendary Dave Cavan. I was stunned when I watched it.